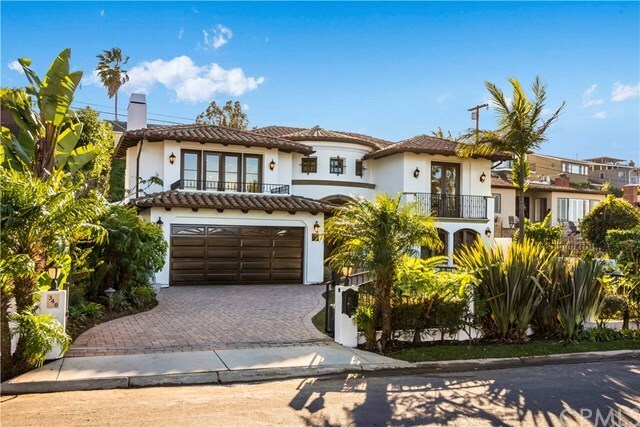 With prominent curb appeal in a highly sought-after neighborhood this beautifully updated coastal living estate in one of Redondoâs finest neighborhoods of Hollywood Rivera was designed by Louie Tomaro whoâs known for his high standard of excellence. The manicured front yard with gated driveway, and lush landscaping adds automatic curb appeal. Enter through the double front doors to a welcoming formal entry with high ceilings, abundance of natural light and a custom designed staircase. Adjoining the living area is a dining area and an open concept newly designed state-of-the art modern chefâs kitchen with stainless steel appliances and access to the beautifully landscaped and private backyard with ocean breezes and outdoor dining. Or you may choose to enjoy your morning coffee off the kitchenâs front balcony with peekaboo views of the ocean. Featuring 5 bedrooms, each with their own private bath and one on the entry level which can be used as a private guest quarters or home office. The master is the consummate ownerâs suite â featuring a spa like bathroom and enormous walk-in closet. Plantation shutters, hardwood floors, 18 ft foyer ceilings, air conditioning, solar powered, water softener, perfectly manicured oversized front lawn, faux grass rear yard with water feature, and a beautifully redesigned chefs kitchen make this home a perfect beach family residence. Directions: Calle Miramar to Via Colusa.